Location, Location, Location! 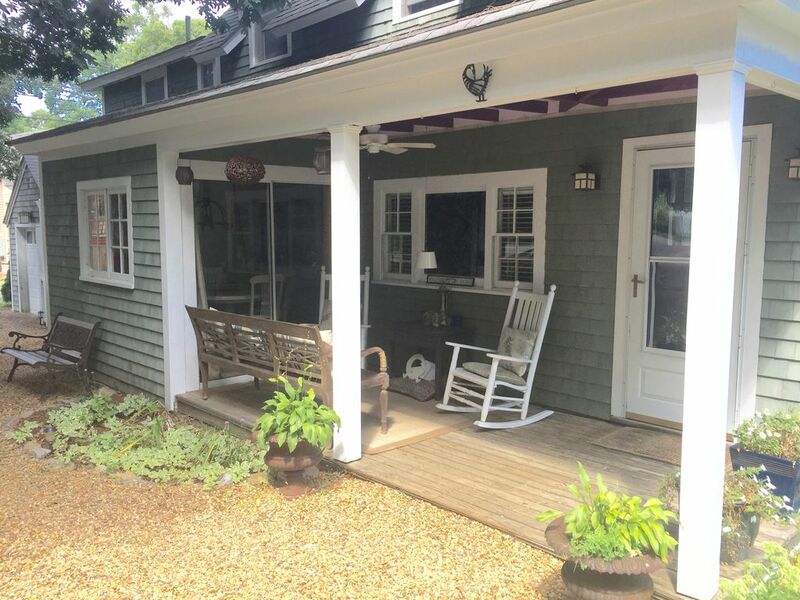 Charming cottage style home located in the sought after East Chop area of Oak Bluffs. Fabulous front porch for people watching and private backyard with wonderful area for al fresco dining. With 4 bedrooms and 2 baths, it can comfortably sleep 7 people . Walking distance to Circuit Ave. the active town center, Oak Bluffs Harbor, the beach and East Chop Lighthouse, its quiet location provides a nice contrast and retreat. This is a non smoking property. Excellent owners . Greeted us at time of arrival and took us over their well appointed home. Very confiortable outdoor area which we used for meals and nite time conversations. The updated kitchen was a joy to make meals in. The location was very convienient to town - other guest were able to walk to everything local. Would definitely rent again . The property is absolutely beautiful. It’s more beautiful than the photos even. The location is a 7 minute walk to Nancy’s. Perfect. The owners were on site when we arrived so it was great to meet them and hear about the history of the house. Unfortunately, August 2018 was incredibly hot and humid. Because the house doesn’t have air conditioning, it was a little too warm on some days. The outdoor shower and backyard are amazing, however. Also, a washer and dryer would make a big difference, but we knew there was no w/d when we rented the property. All in all, it was a lovely stay. I hope to return when the weather is not quite so unusually hot! If you get a/c and a w/d, I wouldn’t even consider staying elsewhere. Thank you, Kathy and Marc! Marc and Kathy are the best! We arrived at their lovely cottage and found every detail to be absolutely perfect. The decor is meticulous and thoughtful in every way! Their home is quite spacious and it's the multi-use areas of the home that make it so special. All the main living areas downstairs are large and allow you to work a little if needed, read, or watch a movie without disturbing the rest of the family. The kitchen is very well appointed. In fact, it has everything that my kitchen at home has! The bedrooms are upstairs with the master on one side and down the hall are the rest.The baths are updated, and we especially love the outdoor shower which is very popular with my kids. The back yard is perfectly appointed with a gas grill and a dining area under a flowering trellis. Sitting on the porch in the evening is a great way to unwind from a day at the beach. The location is really perfect! Short walk to beach, harbor with charter boat fishing, para-sailing, jet skiing and sailing lessons available, town center with numerous restaurants, historic Campground with its beautiful Gingerbread Cottages, Art District, Flying Horses Carousel and Ocean Park. Easy access to Island bus transportation and Steamship Authority Ferry. Farm Neck Golf Course is a short drive away.